Over one year our teachers, management, curricula, the organization and implementation of training were examined and finally found to be good. On December 14, 2015, the Gaiatree Foundation was presented the certificate of appreciation. 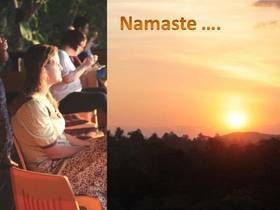 Thus are now 200/500 hours yoga teacher training recognized worldwide. Gaiatree yoga is for everyone. No matter if you are ill or weak, young or well advanced in years, irrespective of your faith and believes, gender, nationality, or social background: You can succeed in yoga if you practice with focus. If you are new to yoga, welcome! Yoga can change your life. If you are ill it can help you feel better. Are you depressed, anxious, tired, or addicted? Do you suffer from back pain? Yoga can bring you relief. Regular practice can also be beneficial for persons with chronic problems such as arthritis, diabetes, multiple sclerosis, high or low blood pressure. In yoga, the understanding of health differs from western medicine. The holistic approach includes emotional wellbeing, mental resistance, joy, and spiritual growth. We work on a mental level, which has an effect on the body. You stretch and strengthen your muscles, which effects blood circulation, digestion, and breathing. You strengthen and calm your neural system. This is not a usual yoga class. In fact, if you have a medical condition and attend a randomly picked yoga class you might suffer more than before. In some way, therapeutic yoga is comparable to an appointment with your physiotherapist or as rehab time rather than an actual yoga class. For people with serious medical conditions, yoga therapy is usually offered as an individual class or in small groups. Therapeutic yoga is gentle and nurturing even though it can be a challenge, too. Our focus is on body perception and body posture, which lead to a relaxed and rhythmic breathing when combined with movement. Participants are taught how to perceive subtle sensations of their muscles or joints, organs, as well the inner experience of the mind. Furthermore, there is a strong emphasis on relaxation. The approach is individual and tailored to every participant’s needs, capabilities, and reactions. The teacher/therapist observes the students’ practice and determines contraindications. In the beginning of yoga practice, every participant is invited to an extensive conversation. In the end, every student is provided with an individually tailored sequence of exercises, techniques and rules of conduct to implement in daily life. Regular consultations are part of the exercise plan. Vipassana– see things as they really are. Vipassana is one of the most ancient Indian meditation techniques. Being lost for humanity for a long time, it was rediscovered by Gautam the Buddha over 2,500 years ago. Vipassana means to see things as they really are. It is the process of self purification through self observation. It begins with the observation of the natural breath in order to concentrate the mind. With keen awareness, you observe the changing nature of body and mind and experience the universal truths of impermanence, suffering, and nonexistence of the ego. This recognition of truth through direct experience is the process of purification. The entire way is a universal remedy for universal problems and does not have to do anything with organized religion or sectarianism. For this reason, it can be practiced by everyone, at any time, in any place. The unique connection of Gaiatree Yoga (Yoga sutra) and Vipassana (Sattipathana Sutra) extends the popular concept of Hatha yoga as a physical discipline to a strong therapeutic and spiritual dimension. It is a yoga of self realization. The practitioner develops effective techniques that he or she can easily integrate in everyday life. This way, the unaware powers of the restless mind are harmonized and emotional conflicts solved. What do you get out of Gaiatree yoga and meditation? -	Discover a changed body perception. -	Eat consciously and healthily. -	Refill your energy while breathing. -	Improve stamina and health. -	Relax in any situation. -	Achieve stress relief in everyday life. -	Increase your ability to concentrate. -	Find inner calm and peace. The charitable organization Gaiatreeschool supports educational projects in Odisha/North India. By participating in our courses you support the organization’s work. Mike Narada is German and he has been living in India since 2009. As co-founder of Gaiatreeschool Foundation and the Vishwanedam Ashram (from Sanskrit: where the universe grow) in the center of Odisha, he has been involved for many years for the rights of Adivasi / tribal people. Yoga and Vipassana has been an integral part in his life for more than 20 years. For the last six years, he has led the Buddhism Mahabodhi Yoga High School in Leh / Ladakh in Himalaya. Every year, up to 3.000 students join in his inspiring yoga and meditation classes, in 3.500 meters above sea level. His yoga classes are well structured and are testimony of a sound knowledge and basic experience. For all courses: 10 per cent of the course fees will be donated to the Foundation Gaiatreeschool.